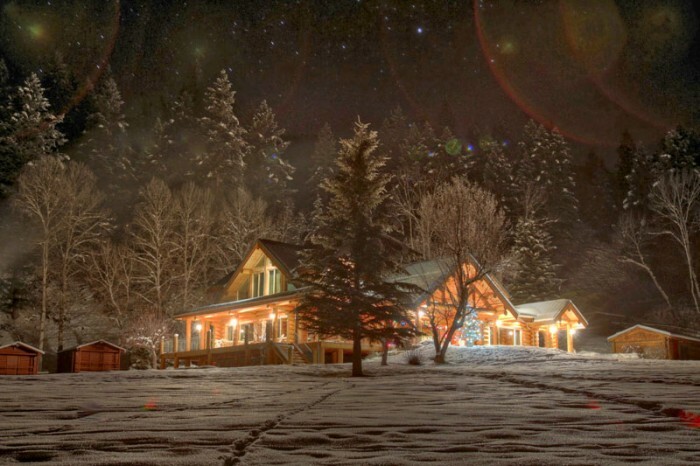 Home / Why We Love Log Homes and Cabins Blog / Log Cabin Christmas: a Cozy Country Tradition! Why DO we love log cabins so much at Christmas? 1. We value the “comfort and joy” of our traditions more than ever at this time of year. The appeal of a log home is a combination of common sense and nostalgia…you can live comfortably, even luxuriously in a work of art while you keep a traditional craft alive. A log cabin is a long-lasting tribute to our proud history in a world that can feel like it’s changing too fast. Early pioneers had to “prove up” on their homesteads, not only by working the land, but by building a home and living there for five years. These little dwellings (often log cabins) kept families safe and warm in a raw country. A log cabin on 160 acres announced, “This is my land and I’m here to stay.” A log home today still represents success while it makes a statement about your appreciation of fine craftsmanship and enduring North American traditions. 3. Let’s face it: when it comes time to “deck the halls” Christmas décor looks absolutely fabulous in a log home (preferably with some snow piling up outside!) Visually warm as well as warm to the touch, it’s no wonder that we tend to call log homes “cozy” no matter how big they are! The neutral backdrop of logs invites endless possibities for colorful seasonal decorations and balances the crisp brilliance of sparkling lights. 4.“Oh the weather outside is frightful but the fire is so delightful!” However you spend long winter evenings, you secretly want to sit by a fire when the temperature drops. There’s something primitive about gathering beside a fire, undoubtedly dating back to dark nights in ancient times when a fire meant a place to cook, get warm and dry, and kept man safe from whatever wild animals lurked in the shadows. 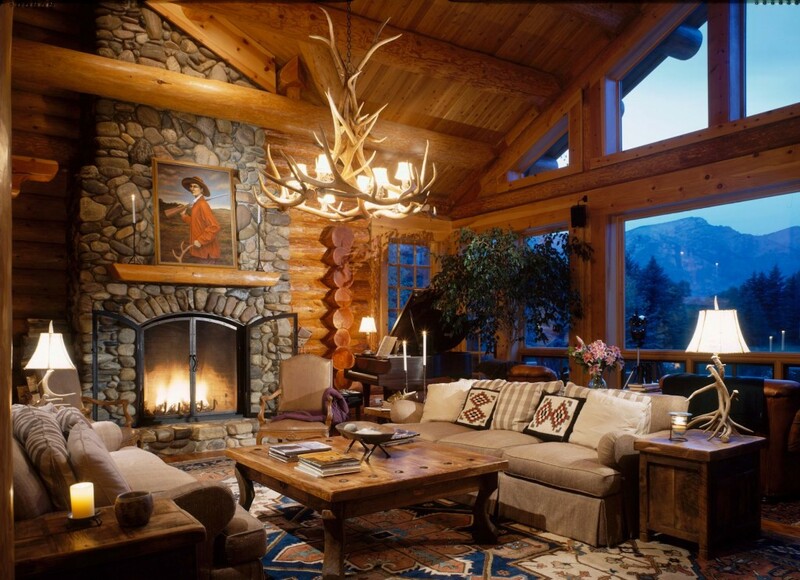 A stone fireplace in a log home, however, is the closest indoor equivalent of that primordially rewarding campfire experience. Bringing the outdoors in, it’s satisfying in ways that words can’t describe! 5. Natural elements in our homes help calm and relax us! (Learn more: How a Log Home Helps Reduce Stress ) Having yourself a “Merry Little Christmas” can be a lot of work. Do you scour Pinterest for the coolest Christmas decorating ideas and host festivities that inspire and awe everyone you know? Or are you struggling to keep up your Christmas spirit after one trip to the mall leaves you wishing you could hibernate until Easter? 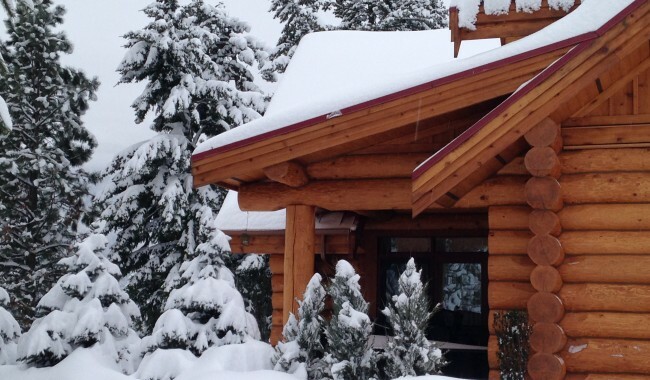 A quality log home is a fortress so whether you feel like welcoming everyone you know into your haven of warmth and cheer or turning off your phone and hiding with a book beside the fire, the soothing ambiance of your log home is perfect for either. Enjoy the most traditional Christmas ever! Long evenings safe from the outside storm, sharing drinks and treats with favorite people, conversation and laughter mingling with the warm glow of fire light in your log cabin! You don’t have a log cabin? No problem. There are lots of ways to fill your space with the rich warmth of a log cabin Christmas, but what about next year? And the year after that? How many things will you create in your life time that will last a few hundred years? A log home will stand for centuries. (Learn More: Your Home is Your Castle! Build it to Last) If you’d really love a log home for Christmas, let’s begin with the first step on an exciting journey that will gather your family together and leave a landmark for generations to come.